NEW: DRONE VIDEO OF WATERPLANE FLYING taken from above the Leicester flying field! Your correspondent (Flyco) made a long-delayed return to competition at this excellent venue after missing several meetings due to outside life getting in the way! The LMFC is very well organised, with extensive c/l and r/c flying areas, a clubhouse with loos,kitchen and a workshop (which I found invaluable halfway through the day). It’s also very fortunate in having a c/l enthusiast in Andy Green, who organised everything to perfection. Finding something unexpected and new in c/l is always an event, and this meeting didn’t disappoint. After the pleasant surprise of being able to leave our cars next to the pits (not in the main car park as usual), my eye fell upon a very large oblong pond next to the deck. The penny dropped when I noticed several floatplanes sitting next to it – wow, a chance to take off and land on REAL water (rather than the imaginary stuff us carrier folk are used to!). 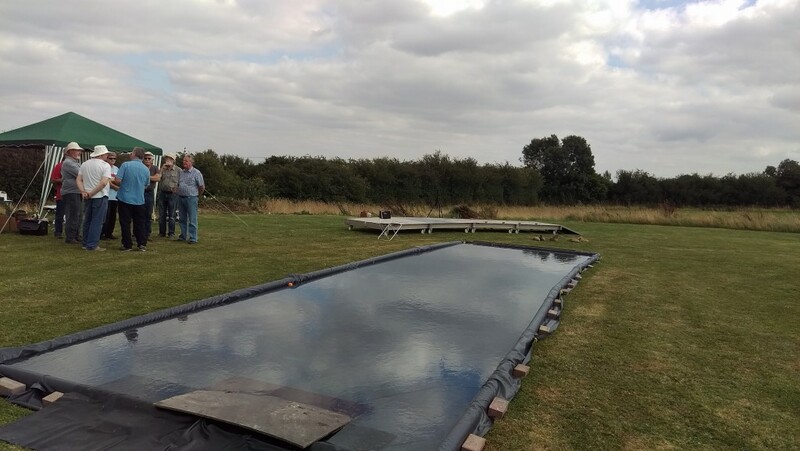 Andy Green had designed and built it, and once filled with the club’s free borehole water it looked utterly inviting – so much so that wife Jane thought a paddle would be a good idea as the day was rather humid – and she got her wish later after dropping her sungigs right in the middlle of it, demanding a barefoot recovery of course! 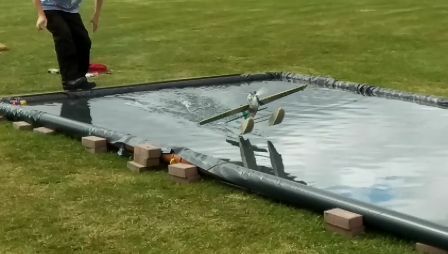 As this “water feature” was not part of the main competition, regular carrier flying went ahead in parallel, starting with Fred Skinner who is campaigning his Eric Conley-inspired Me109T very competently. 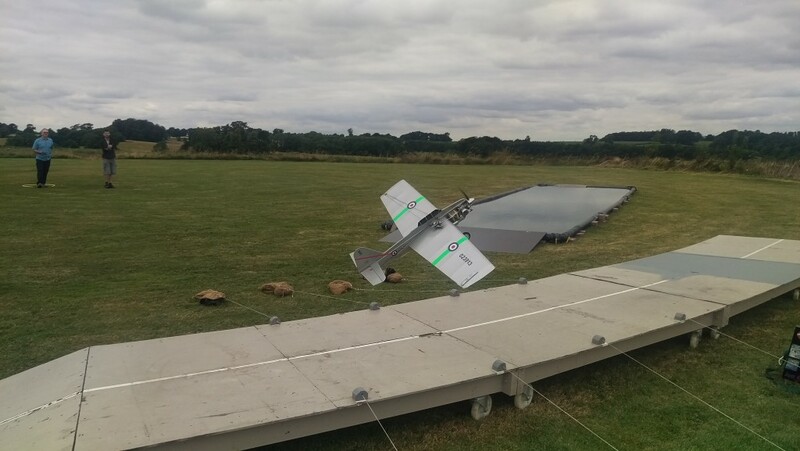 It’s now capable of delivering 200+ point flights regularly (perfect landings permitting!) and Fred duly set the bar with 204.2 with this purposeful model with EVO .36 power. The competition was fierce, however, and this creditable score was eventually only able to deliver 6th place. Next up were a brace of Seamews. the first from Dave Holmes, followed by Andy Housden. Dave’s model looks pristine, and might be a new build. Another member of the OS .40 fan club, Dave flew steadily and consistently for two flights with only five seconds difference between them. His best was good enough for 7th place with 186.5 points, but Dave could well be a top three contender if he can add another 30 seconds to his slow seven laps. Our other Seamew pilot, Andy Housden (also an OS .40 fan) is the ultimate professional at this game, and although his model always looks as if it’s just been mauled in combat by an Fw190, it’s still incredibly competitive and Andy is always calm and competent at the handle.He was able to enjoy a day competing rather than coping with his normal role as Contest Director because Andy Green was in charge this time, being in charge on his home turf. Although Dave Holmes was five seconds faster than Andy with his Seamew on the first seven laps, Andy was nearly half a minute slower on the second seven, racking up 207.4 points in total to pip Dave and Fred for 5th place. 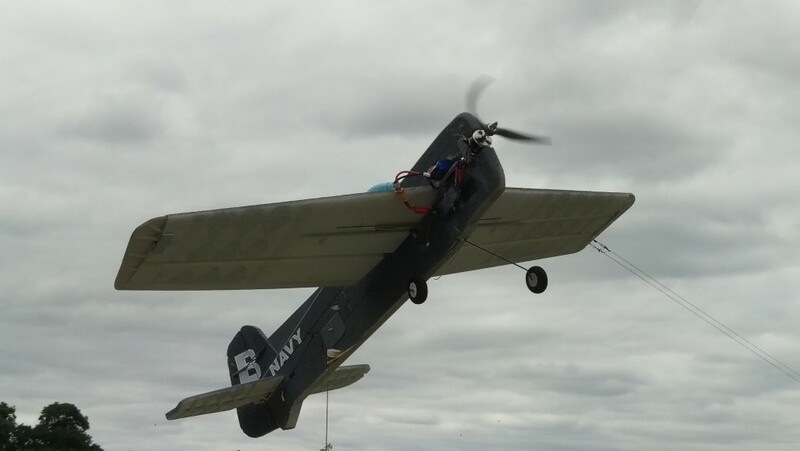 Andy sportingly owned up to a tailwheel rather than a hook arrest on his second flight – the landing in the photo below – which didn’t actually impact upon the results. Chris Howell has been making a name for himself recently as a pilot to be reckoned with, firstly with his conventional Ryan Fireball, then with another “Conley”-style Me109T, but he’s really broken through with his new calm-weather model (nominally a Wildcat) which takes its design cues from the sudden move towards ultra-light models that Nigel Frith began with his Zero at OW last year. 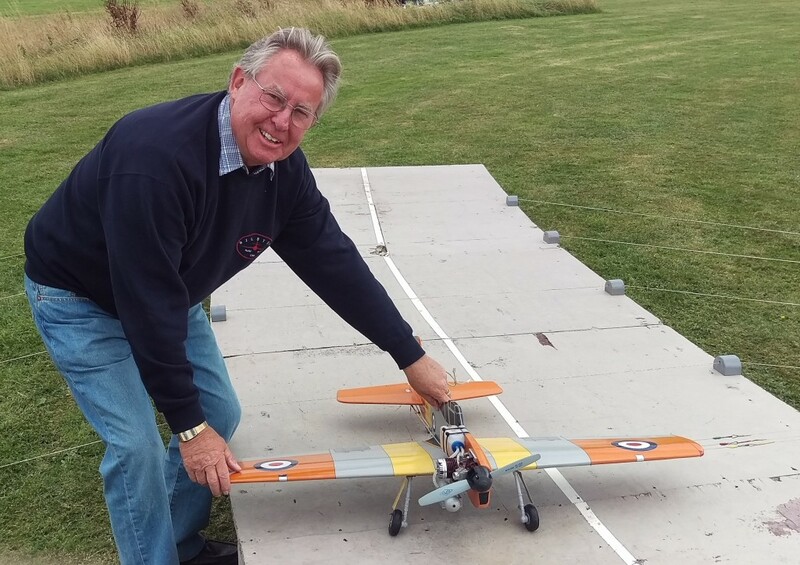 Chris has gone over to electrical power too, and has based his latest model on an RTF r/c Yak aerobatic aircraft. It’s made from expanded polystyrene with carbon reinforcement and flies like a dream on the slow seven (184.8), although Chris is the first to admit that it’s well off the pace on the fast laps (~45 seconds). It wasn’t so long ago that I recorded the first 3+ minute loiter in UK competition but that’s the bar we now have to aim for! Chris deserves full credit for experimenting and getting it right – very well deserved! 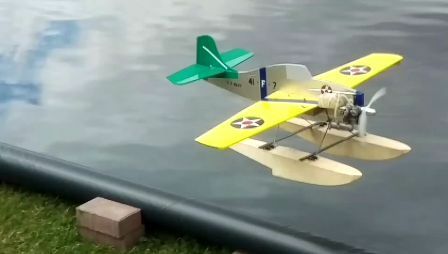 I was amused to see his old i/c-powered Fireball reallocated to experimental flying from the water tank, using a pair of Hobby King floats salvaged from an r/c park flyer that had sunk in the tank earlier. 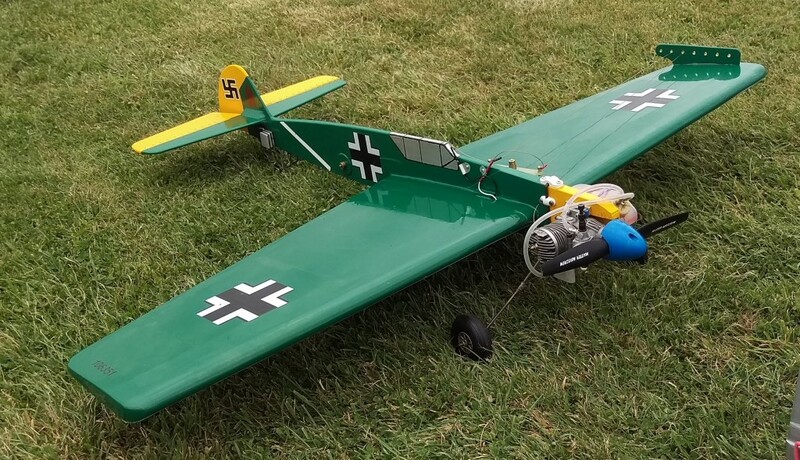 Next up on deck was your correspondent Flyco, with his trusty Housden Hellcat (yes, an OS .40 again), re-fitted with an r/c throttle, and testing out a prototype combined c/l+r/c handle loaned by Den Saxcoburg – the chap behind Den’s Models on the Isle of Wight.The handle is a very clever design concept, putting all the Tx bits into a slide-out cassette. This allows the pilot to leave the handle grip and lines out, remove the cassette, and take it back to the model for starting and throttle-checks. No looped lines=no trip hazard! My own ham-fistedness when I got back to the handle and slid the cassette back in resulted in my wrenching the leads out of the battery socket – result, no throttle! 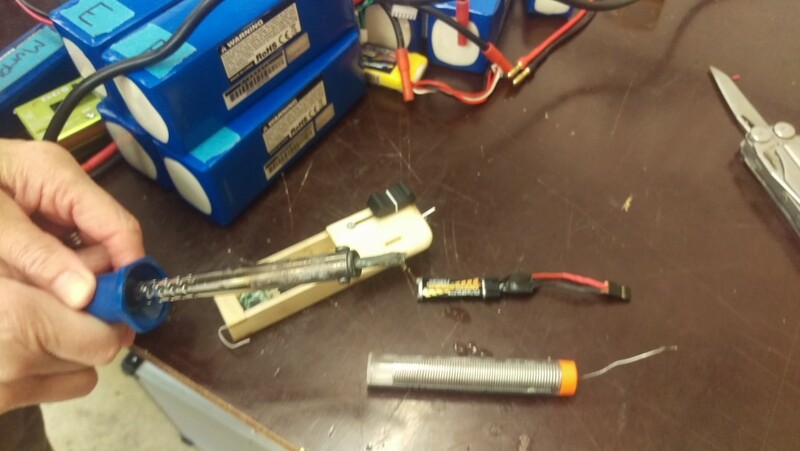 A visit to the club workshop and the loan of a soldering kit allowed me to make a repair, so I reflew later. The result was OK by my modest standards, the new handle worked well, and I picked up a max point landing by slamming the model onto the deck after the hook-release failed. 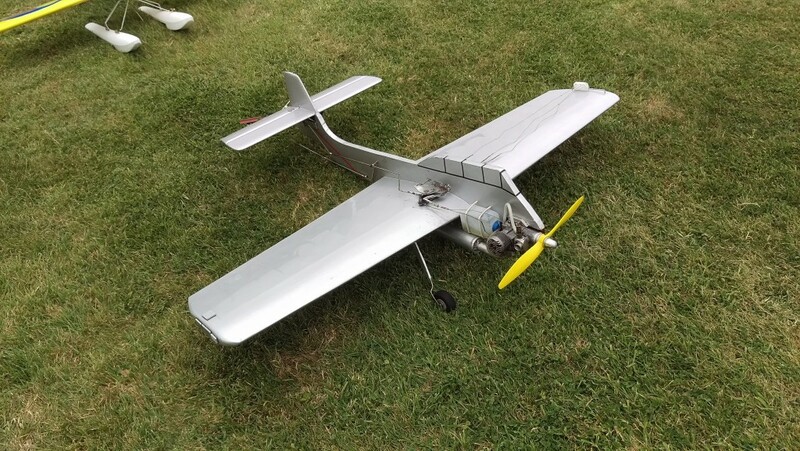 So, that meant a busted prop and silencer but still a mildly satisfying 142.7 points and the r/c grear on the plane was still working perfectly after that 10g landing – at my level I call that a result!.A second flight later on with my faithful “Joe Just” Wildcat did a little better, making 153,9 points for 8th place and surviving another kamikaze landing without damage – thank you again for a face-saving model, Joe! Johnathon Crabtree flew after the lunch break, with his classic Spearfish (J’en 37) challenging Chris Howell for the lead. 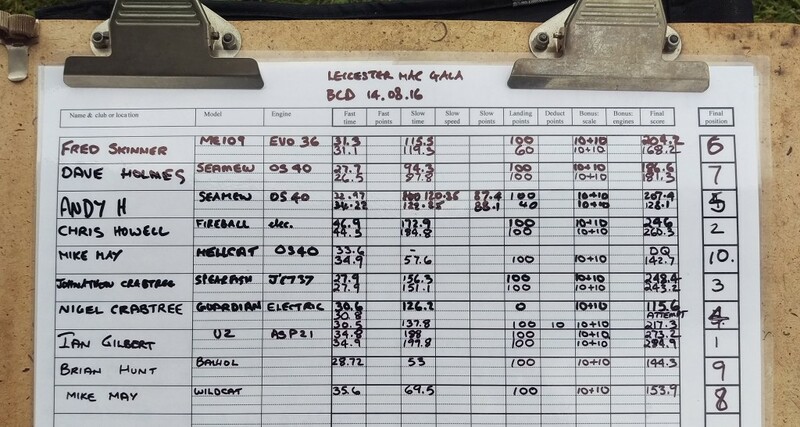 Despite two cracking flights, both notching 150 second plus slow segments and clocking fast laps nearly 20 seconds better than Chris (27.9 vs 46.9), he could not get anywhere near the three minute loiter necessary to catch the foamy Wildcat, having to settle for third place with 248.4 points. Technology moves inevitably forward, but I think the result between Chris and Johnathon might have been very different if the weather had been wet and/or windy! 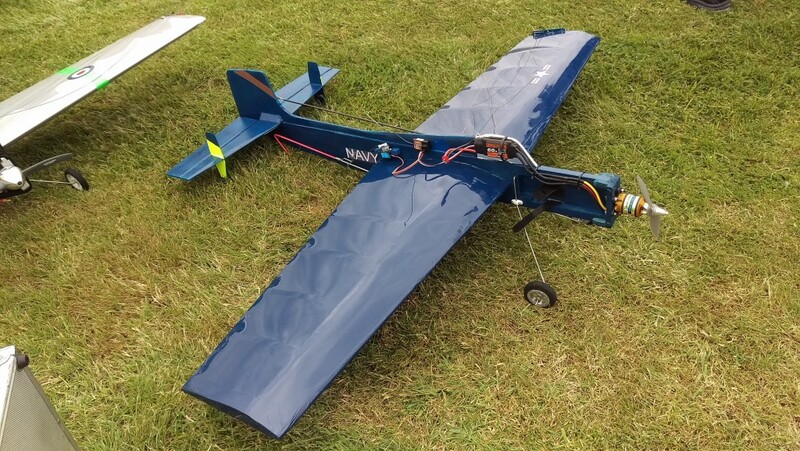 Nigel Crabtree flew his very smart electrically-powered Guardian, not quite as fast (or slow) as Johnathon’s Spearfish but very competitive in the light-to-middleweight field. A poor landing on flight one robbed him of a 226 point score, but he persevered and lodged himself firmly into 4th place with 217.3 points with his second attempt – again this could have been 227.3 but for two missed approaches, although it didn’t impact upon final placings..
With the afternoon wearing on, our current UK champion Ian Gilbert stepped up to the circle, knowing by now exactly the score he had to beat (Chris’s 260,3). 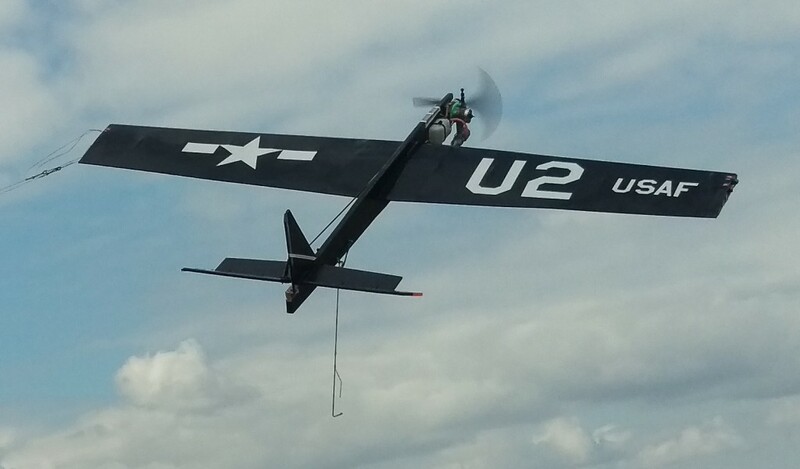 Ian was flying his lightweight, and comparitively low-powered U2 (ASP 21). He’s won just about everything he’s entered with this model – which elegantly combines the current lightweight meme with a model that is still clearly based (at least from the outside!) 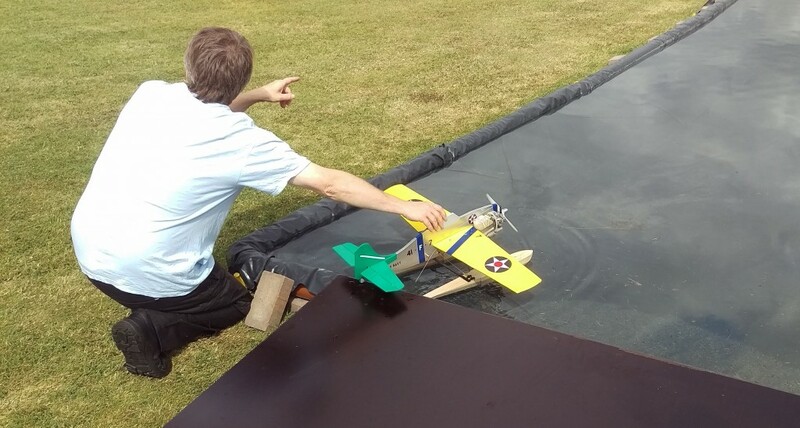 upon the previous generation of successful classic models.With no apparent effort Ian turned in flights of 273.2 and 284.9 points, easily surpassing that magic three-minute loiter target and delivering two perfect landings. 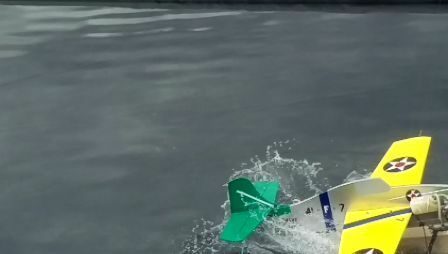 Ian makes it look so easy – but it’s his uniquely winning combination of design, build and flying that wafts him to the top of the pile every time. IMHO, if he’d had to get 300 points to win, that’s exactly what he would have done! Final competitor was Brian Hunt, campaigning his beautiful Sea Balliol. 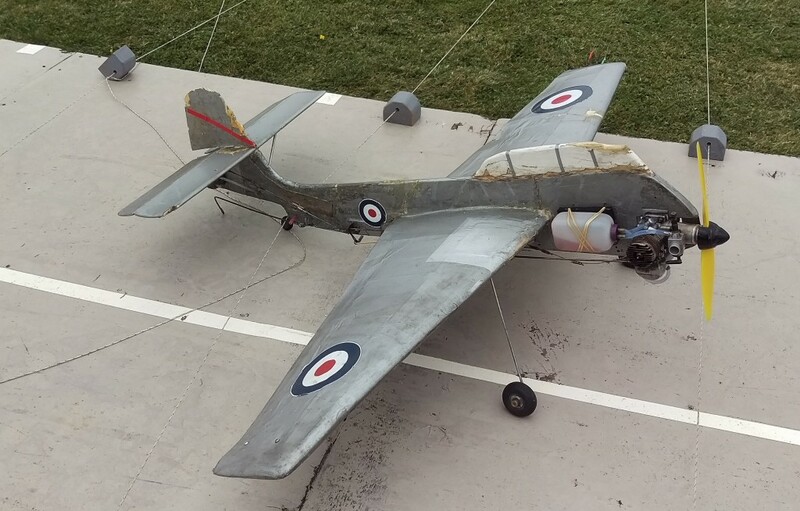 This model is resplendent in full scale paint and markings, and has been praised by everyone who has seen it – including our continental friends – as the best looking plane out there at the moment! 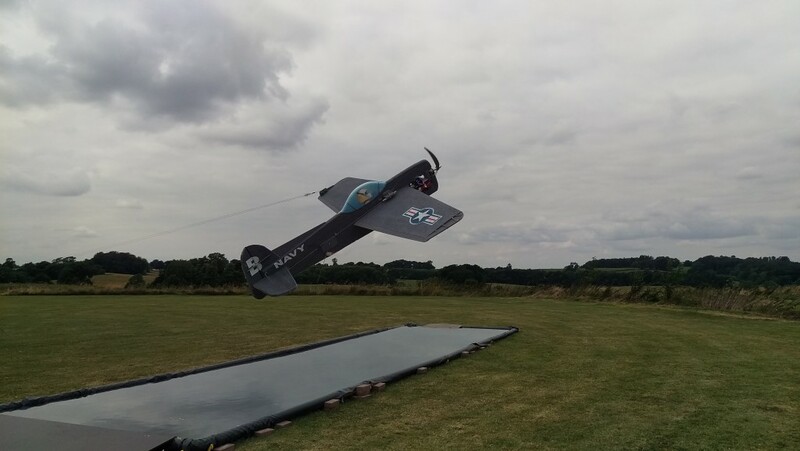 Brian has taken a while to sort out the model and his flying technique, but he’s now scoring full-mark landings and certainly making progress with a another perfect landing and a total of 144.3 points – good stuff! 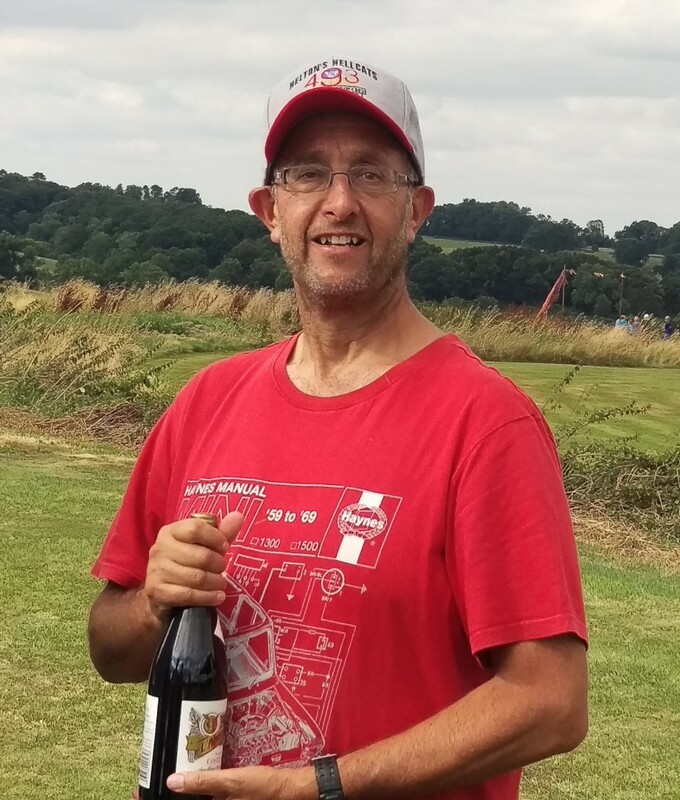 The prizes (nice wine and kits) were presented by Andy Green, who got a big round of applause from us all for providing such a well-organized and enjoyable day out. 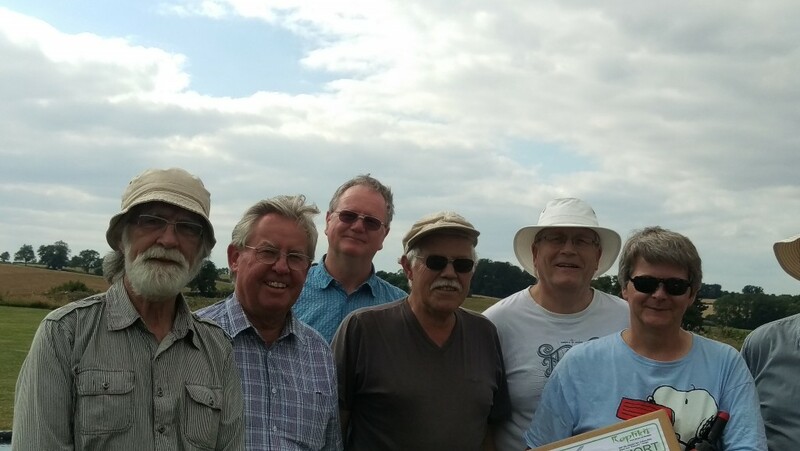 Everyone helped out, we all took time out to eat from the club’s excellent Gala BBQ, and were treated to the bonus of a low-level flypast from a preserved Jet Provost (full-sized!) over lunch. With good weather and good company, plus a water tank, what else could a c/l carrier flyer want? Thanks again, Andy! Numero Uno – Ian Gilbert! Some of the rest of us! Temporary results sheet pending transfer to Excel – ignore 10th place man – he (Flyco) was actually the same guy that came 8th!